Traditional stuffed cabbage, though tasty, is fairly labor intensive. It's worth the effort if you like to make it as a special holiday dish, but what do you do if a craving strikes on a busy weeknight? 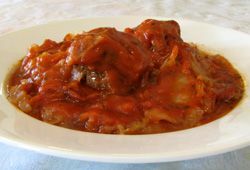 This unstuffed cabbage recipe replicates the rich flavor of slow-cooked cabbage and ground beef bathed in a sweet-and-sour tomato sauce, but with much less work. It takes a while to cook but needs only about 20 minutes of hands-on time, and you can do most of the prep while the cabbage steams. Put 2 cups of water into a large stockpot, and bring to a boil. Add the cabbage, reduce the heat to low, cover, and steam for 20 minutes. While the cabbage is steaming, make the meatballs: In a large bowl, mix together the beef, 1/2 cup tomato sauce, matzo meal or breadcrumbs, paprika, garlic, salt and pepper. Form the mixture into meatballs and place them on top of the cabbage. Cover and continue to cook over low heat. In another bowl, mix the 2 cups of tomato sauce, lemon juice, and brown sugar. Pour the sauce over the meatballs and cabbage. Cook, covered, for 1 hour, and then stir and taste. At this point, you can adjust seasonings by adding more water, tomato sauce, lemon juice, or brown sugar according to taste. Cook for another 15 to 30 minutes, or until the meat is cooked through and the cabbage is tender. Many think of Stuffed Cabbage as a fall or winter meal, but if you're experiencing a cool spring, this will work nicely as a Passover dish. Use matzo meal instead of bread crumbs, and you'll have a hearty kosher-for-Pesach entree. ﻿Add a starchy side to sop up the sauce -- think Turmeric Rice with Golden Raisins, roasted potatoes, or homemade baguette. And a Moroccan Carrot Salad adds a little spice to cut through the sweet richness of the cabbage. Try a refreshing fruit salad for dessert.